Asia is the continent that offers you so many interesting things that you can’t get bored of it. Asian countries are renowned for their inventions and especially for the extreme ones. Their quality is sometimes to be analyzed, but when it comes to inventions, it is important to be something “wow” so we write this article about Asia’s First Fully Solar-Powered Quadcopter. 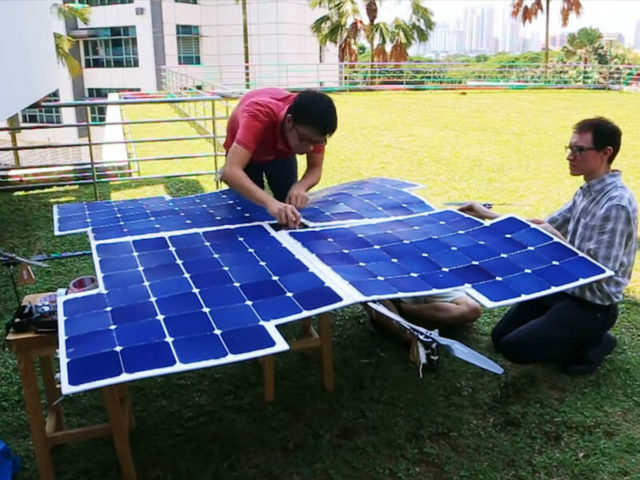 Students who invented this option in Asia have created a quadcopter that is fully powered with solar energy without the need for any battery or other energy sources. This model rises to a level of 10 meters and flew for two minutes. Starting in 2012, more students have created different ideas to design a solar energy flight drone. The Asian model is very lightweight drone considering the very large dimensions. Flight times can be said to be “unlimited”, as long as sunlight keeps it in the air, it can fly even hours. It can land on a flat surface and control the height of the flight. To be so lightweight, even if measured 4sqm is made of carbon fiber and weighs 2.6kg. It is equipped with 148 individually characterized silicon solar cells and supported by a frame equipped with four rotors and can fly with a remote or even on its own with the built-in GPS system. The boys, together with their iDP teacher, created within two years, 3 prototypes to make as much improvement as possible by adding solar cells as well as adjusting the frame material to make the drone more efficient and lightweight. As the prototypes were many, they obviously had crashed during the project, but they thought they were the most memorable moments. We encountered many engineering challenges when building the drone, ”shared Mr. Yeo“. These included finding an optimal number of solar cells efficient and light enough to power the propulsion system, which in turn had to be light and at the same time able to produce sufficient thrust to lift the aircraft. Other issues we faced included tuning and calibration of flight controls to enhance flight stability, as well as designing a frame that is lightweight yet sufficiently rigid. Compared to battery-powered drones that can fly for about 30 minutes, this drone is not limited by either the size or the battery level using the full solar energy, this gives it a big advantage over the usual drones. Why Asia’s First Fully Solar-Powered Quadcopter was invented? Some of the examples for which this drone was invented are photography, small packet delivery, inspections in areas affected by disaster or simply hard-to-access areas. Also, batteries can be added in case the sunlight “leaves us” or camera for quality shooting. At the end, of course, the boys are set on big deeds, they want to improve the qualities of this quadcopter, the reduction in size and the possibility to commercialization this type of drones in the near future.